Master Choe’s many years of martial arts training and experience inspired a dream to start a quality school where he could pass on the martial arts tradition of excellence he had learned. He particularly desired to have a school where he could train his students to be masters not only of techniques but of themselves as people; help them to develop strong bodies and strong minds; and inculcate a tradition of excellence. Choe’s Martial Arts is the result of that dream. All students, regardless of belt rank or ability, are trained directly by Master Choe himself. Students who desire to become competitive athletes in Taekwondo will be able to pursue this goal at our school, the home of the only Taekwondo tournament team in Brevard County (Team Tempest). We are also the only Taekwondo school in this area with its own electronic hogu, the scoring system used at major Taekwondo sparring competitions (including the 2012 Olympics in London). Our students regularly engage in open and AAU or USAT qualifier competitions at both the state and national levels, and have consistently placed in the top tier at those competitions. 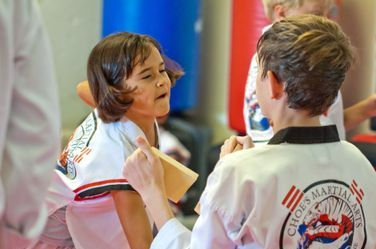 Choe’s Martial Arts is also a wonderful place for families The school offers a special rate to make it easier for multiple family members to train together without maxing out the family budget. 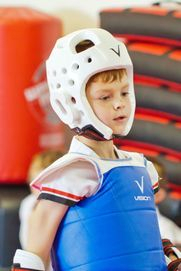 Parents can take Taekwondo with their children, opt for separate classes tailored for adults, or simply take Tai Chi or cardio fitness classes. Whatever your fitness needs or interests might be, Choe’s Martial Arts has something for you! These five tenets are the foundation for all training at Choe's Martial Arts.